Whether you need to monitor right-of-ways for encroachment, towers, hardware, and lines for issues, or improve safety margins, our drone-based solutions deliver a flexible, cost-effective way to inspect your critical utility assets. Monitoring utility assets can be costly and dangerous. Traditionally, helicopters are used to inspect both towers and power lines, risking the helicopter’s rotor blade striking a wire and causing catastrophic damage and often fatalities. There’s no need to own a drone, maintain a pilot on staff, or analyze data. We’ve built our service based on years of operations research and work for leading utilities. As a result, you can procure enterprise-grade aerial intelligence—featuring easy-to-understand action items and takeaways—through a simple, turnkey service. Credentialed pilots, with experience flying utilities infrastructure, deploy thermal, LiDAR, and multispectral sensors to collect data over the assets. Using DMS, drone program managers maximize their fleet’s utilization, ensure regulatory compliance, and better protect the safety of their workers. By working with PrecisionHawk, Utility leaders can employ the latest in remote sensing technology. Our team of PhD-holding data scientists and solutions engineers hand-select hardware configurations that deliver the most precise and repeatable data outcomes. Measure slight line sag, capture assets beneath vegetation, and calculate minuscule temperature differentials on solar panels—that’s the power of advanced, drone-based sensing. According to a CBS Denver report, Xcel Energy in Colorado estimates flying drones BVLOS will cost between $200 and $300 per mile compared to helicopter flights that cost an average of $1,200 to $1,600 per mile. 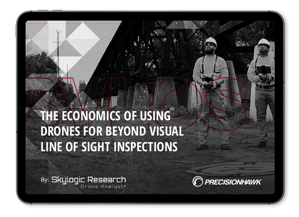 One of the top five largest gas and electric utility companies in the U.S. by market value reported that the cost of drone-based VLOS inspection is “extremely competitive with the helicopters” while significantly reducing the risk of fatal accidents. Another utility company—one that brings electricity and gas to nine million customers each day—operates a self-service model in which linemen are given small multirotor drones in their toolkits, and they fly VLOS to inspect structures without having to climb them, saving time and increasing safety margins. We help you select the best sensor for the job, and understand the unique needs of utilities.